With the holy month of Ramadan fast approaching it can become easy for those who are fasting to fall into unhealthy eating habits or become physically inactive. Over eating, dehydration and fatigue are common issues that arise throughout the month. However it doesn’t have to be this way. Making sensible choices and plans, can help you get through any challenges that you may face during the holy month. Ramadan is a great time to look at ones actions and make positive changes, it is time to shed unproductive patterns and create new, more healthy productive habits. For those of you that are fasting, try and be measured in your actions. Do your best to manage the inevitable social and family events without going overboard. Enjoy sweets and deserts in moderation, lean towards healthy wholesome foods, including vegetables, salads, whole grain breads and moderate helpings of rice. Choose lean protein sources such as chicken and fish and where possible get them grilled not fried. A mixed plate containing different elements and food types makes for a great Suhoor meal, delaying hunger whilst providing energy to fuel your body through the fasting period. Vegetables and foods that are high in vitamins, minerals and fibre should be a big part of your diet in general. These food choices can also help to keep you hydrated longer and sustain healthy bodily functions. Reaching for sugary, highly refined or fatty fast foods, may seem satisfying at the time but can really make fasting harder. These foods are quickly digested and only provide short term energy and sustenance, they can trigger an emotional, pleasure like response that is short lived and can quickly make you crave more. Processed foods often have higher salt levels, leading to dehydration, making you very thirsty during your fasting hours. The Iftar meal can follow slightly different guidelines. Dates are traditionally eaten to break the fast. Dates and other dried fruits are easily digested, making them a quick source of energy and nutrients. After a long day of fasting, eating dates can help the body’s blood glucose levels return to normal. When consuming dates before a meal it satisfies the hunger sensation, which in turn helps to prevent overeating. Think about the bigger picture, over eating or making a few unhealthy choices in one meal is not going to destroy your physique. Having a measured thought process, balancing out some of those perceived ‘bad’ food decisions with generally more healthy ones helps you lead a more sustainable, long term healthy lifestyle. It’s the same with exercise, don’t let just missing one session in the gym derail your entire fitness journey. Think positively, make up for the lost session or the overindulgent meal by deliberately working harder or eating less for the rest of the week. 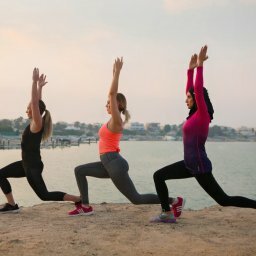 Ramadan can be used as a month to continue your exercise program or to begin a new fitness journey. It is a great time to reflect and make positive lifestyle changes. Planning ahead and having a structure in place will reduce the risk of failure. Pick a time to exercise that suits you. It’s not about doing anything special or unusual, there are no special tricks. It’s more about your ability to adhere to the plans you have put in place. Setting unrealistic expectations will just demotivate you. Keep things manageable, if you are new to exercise, don’t over do it, working out once and being so stiff you can’t exercise again for the rest of the week isn’t ideal. Whatever you do, try to fit it into your lifestyle, helping you to form better long term habits. Getting support from a professional trainer, coach or even a friend will help. Staying hydrated throughout Ramadan can be difficult with a large fasting period everyday. Keeping hydrated can increase energy levels and help prevent fatigue as well as promote weight loss and prevent muscle cramps. Experiment with limiting or reducing the amount of caffeine that you consume over night as this can cause disturbed sleep and is also a diuretic, meaning you will need to go the bathroom leading to dehydration. If you’re a coffee monster however, going cold turkey probably isn’t the way to go. Our bodies get accustomed to the amount of caffeine we ingest and build up a tolerance. People who cut themselves off from caffeine often find they experience withdrawal symptoms such as headaches, fatigue and even changes in bowl movements. Drink water and other fluids when you can, you can also get a decent amount of fluid from ‘wet’ foods such as vegetables, soups and gravies etc. Remember, the holy month is a time for re-formation and reflection. It can be a time to set new goals or begin a new fitness journey. For those who are currently putting those plans into action, it can be a time to reflect on achievements, setting plans to continue progress for the coming year. Whatever your path make sure it’s a happy and healthy one.